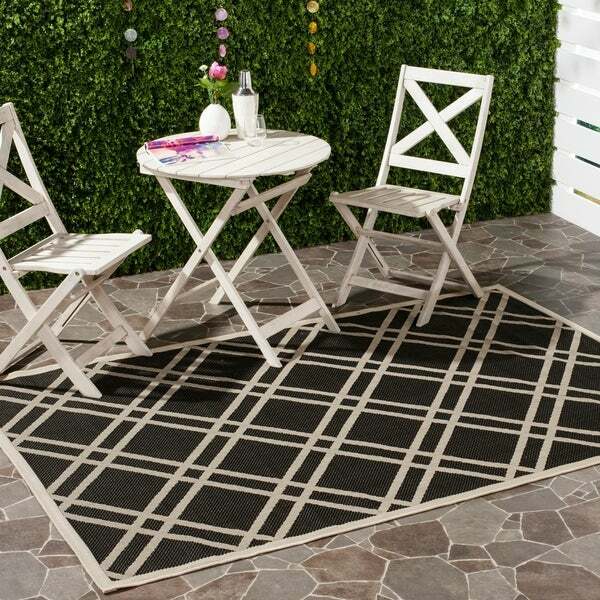 Safavieh Indoor/Outdoor Courtyard Black/Beige Polypropylene Rug - 4' x 5'7"
Contemporary Safavieh Indoor/Outdoor Courtyard Black/Beige Rug - 4' x 5'7"
Safavieh Poolside Black/Beige Indoor/Outdoor Area Rug - 4' x 5'7"
Safavieh's Courtyard Collection creates a dynamic presence with its fashionable and transitional designs that are suited for both indoor and outdoor settings. These rugs have been expertly power loomed of enhanced polypropylene to create intricate motifs and ensure a comfortable surface underfoot. For outdoor use, this rug will turn your deck, poolside, or patio into a resort-style entertaining space. Featuring a main accent color of black, this rug is in vogue with its tasteful and bold modern design. A trellis-inspired motif creates the geometric appeal of this rug. Its clean lines are great for transitional homes in bedrooms, living rooms, kitchens, playrooms, or outdoors under patio furniture. Dimensions 4 ft. x 5 ft. 7 in. Safavieh Indoor/Outdoor Courtyard Black/Beige Polypropylene Rug - 5'3" x 7'7"
Contemporary Safavieh Indoor/Outdoor Courtyard Black/Beige Rug - 5'3" x 7'7"